So things got a little nuts in the kitchen again. I just can’t help myself. No matter how healthy I want to become I revert back to krispies and popcorn again and again. I’d apologize. But first I’d have to feel bad. So this week’s Burning Down The Kitchen interview makes my heart happy. And my tastebuds. You all know happy hearts and tastebuds tend to go hand in hand. It’s how us foodies roll. Happy bellies make happy people. Such is the case with this week’s guest. I had the great pleasure to interview Tara from Noshing with the Nolands. I met Tara through a group we both belong to. We got to know each other and I realized quickly she is one of those people that the more you get to know her the more you like her. She’s just a sweetheart of a lady. She’s also wickedly talented. She whips up things like Trash, and Cheez its that make great snacks for kids and adults alike. She makes desserts that make your mouth water like Orange en Surprise and Stuffed Baked Apples. She has amazing cookie recipes like Cowboy Skillet Cookie and Best Ever Oatmeal Raisin Cookies. Tara also makes some wicked good dinners like Chipotle Chicken Smoked Tacos and Beef Tenderloin with Stilton Pecan Butter. And she tops it all off with great drink recipes such as Pear and Pineapple Smoothies and Cowgirl Raspberry Sparklers. Every single thing she makes is remarkable. Every post just gets better and better. I love visiting her blog. It makes my tummy growl and in my world that’s a good thing. Stop by her blog and she’ll make your tummy growl too. I hope you all enjoy today’s interview with the fabulous Tara. You will adore her as much as I do. All of a sudden I was out of a job and my husband said to pursue my dream, which is all about cooking. 2. What is your favourite thing about it? Cooking, baking, photography, writing…..hmmm pretty much everything. The technical side and photography. Two things I knew very little about before starting. 4. Take us through a typical day with Tara, food blogger and mom. Up before 7:00am and straight to the computer. My daughter has breakfast with dad. Check emails and start to blog. Clean and feed the guinea pigs and dogs. Feed the frog. Get my daughter to school if I am driving. Continue blogging having a coffee and breakfast at the computer. Blog until 10:00am or so. Then chores around the house and shop for dinner and projects for the blog. Walk the dogs. Eat lunch at the computer. In the afternoon I will bake or cook something for the family and my blog and take pictures. It has to be done earlier now with the days getting shorter. Pick up my daughter from school and then off to after school activity or home for tutoring for Amber, piano, homework and reading. Prepare and eat dinner. Clean up. Change the pigs again and feed them. Let the dogs out. Go up stairs and get ready for the next day, laundry etc. Watch “The Chew”, I tape it everyday. Plan some new recipes, and check emails on the iPad. Fall into bed to do it all again the next day. 5. Does your daughter help in the kitchen? Noshing With The Nolands all started with doing cooking lessons with my daughter and a friend every Friday night for 2 1/2 years. . We called it FNCC, Friday Night Cooking Classes. It was a big hit on Facebook with a big following. Amber loves to cook but more so loves to eat!! 6. How do you find balance between life and blogging? Any tips for other moms doing both? It takes up a huge part of your day everyday. It is easier with my daughter in school. You have to be flexible. My husband helps out a lot with it too!! Hence the title of our blog is not just me but all of us. 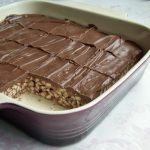 The one good thing is that you can blog about your daily life and show recipes from what you are eating. 7. Do you have a favourite post that you’ve done? Hmmm….that is a tough one, I really like the variety of have going on but if I had to choose I would say Julia Child’s Boeuf Bourguignon. I was so thrilled to be honored on JC100 Facebook page on the day of her birthday. Doing JC100 was a complete thrill for me as I hadn’t been blogging that long and I was overjoyed to be chosen. I did every assignment for all of the 15 weeks we celebrated. She is my idol. 8. You not only cook but craft as well. Where does your love to create come from? I have always liked tinkering around with crafts and Amber is constantly creating things. We are blessed with a large craft room in the basement. I have done a lot of knitting and crocheting in my life time too. 9. Since you love to cook and create, do you host a lot of parties? What advice would you give to others for hosting a dinner party? We are always hosting parties. Just did a big one for Halloween, our annual howler!! Where we have had upwards of 100 people. We make everything homemade. For that party and for every party the key is planning ahead. I am queen of the freezer. It is completely full for our large parties. Mostly things just need warming up. I love being with my company not being stuck in the kitchen. One thing that make me crazy is when you never see the host. It is like you are in a restaurant then. Never do dishes at a dinner party!! Clean up but don’t pull yourself away for long periods of time. Also tag team with your hubby, so someone is with your guests. 10. What are your three essential kitchen tools you couldn’t live without? This list could be much longer than three but I would start with my Kitchen Aid Stand Up Mixer, then a good whisk and a high quality sharp knife. 11. Are you a sweet or savoury snacker? Both but if I had to choose savoury. 12. Beef, chicken or pork? Tough again, but I have always said I could never live without bacon so pork fat rules!! 13. Milk, dark or white chocolate? 14. French Fries, baked potato or mashed potatoes when you’re out at a restaurant? Now that depends on fine dining or not. I would probably order the baked as we have more mashed at home and then it is a treat. Of course if it is more casual then fries all the way. Oh, sweet potato fries are my favorite!! Neither, I have a sensitivity to caffeine. 16. If you could do a guest spot on one cooking show which one would it be and why? Hands down The Chew. I am so in love with Michael Symon and my poor husband has to listen to that every night when I watch it. 17. If you could cook with one person from history who would it be and why? I think you know the answer to this one already…………….Julia Child!! She has been my idol since I was little. I used to slave in the kitchen over her intricate recipes and loved every minute of it. 18. What one splurge kitchen item would you invest in if you won the lottery? Now if we are taking lottery, I would love to do an outdoor kitchen. This wouldn’t be just one item sorry but a whole outdoor kitchen. Would be a dream come true!! 19. Apron or no apron? Both, tend to put it on more for baking, not sure why maybe the flour! 20. Where do you see yourself in 5 years? Is blogging still a big part of the picture? 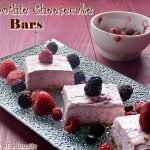 I would love to continue blogging and writing cookbooks. Also a little more R & R maybe pool side on vacays. So I chose to make a simple recipe. It was one of those recipes that I connected with immediately. Then I read over the ingredients and one of them got my brain spinning. 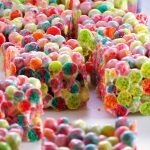 Tara made Froot Loop Squares with fruit twists. I wasn’t sure what fruit twists were so I googled it. I got the word strawberry stuck in my head and everything just spiralled from there. I remembered buying strawberry marshmallows in the states quite awhile ago so I went rooting through the pantry. As luck would have it they were still there. I had picked up rice krispies at the store and one thing lead to another and this is what happened. 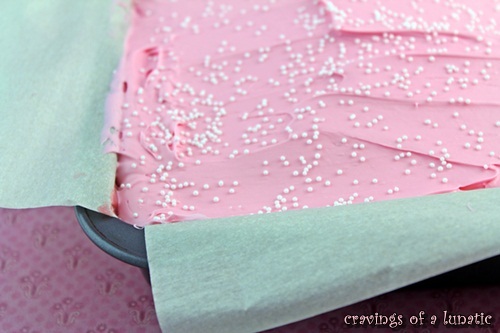 The pink squares were so pretty but still begging for more pizazz so I added some pink frosting and sprinkled some little beads over top. Perfection in a pretty little pink package. 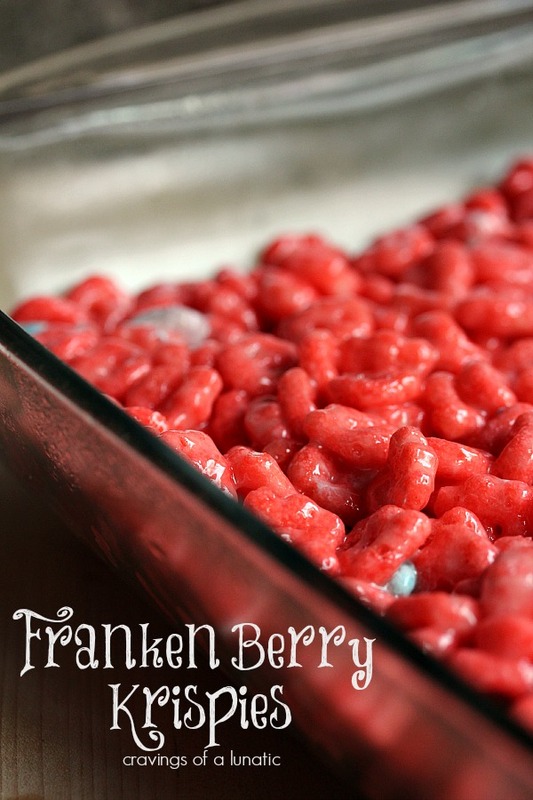 So thanks to Tara for inspiring a new krispie snack. This is exactly why I love this series. It shows any one at home that you can take any recipe and customize it to your own taste and style. That is the beauty of cooking, you get in there and just experiment. Some things work, some don’t. Not all mine work. I tried to use one of Martha Stewart’s ganache recipes over top of this and it failed miserably. But I rolled with it and made it work. Just goes to show you can turn any recipe around. Just be patient and don’t give up. 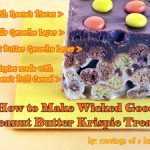 A simple recipe to make a delicious rice krispie treat. In a large microwave safe bowl combine the butter and marshmallows and cook for about 2 to 3 minutes. Remember to use a large bowl because marshmallows expand and you don't want them to overflow. Press down firmly with a spoon sprayed with non stick spray. Take your frosting and add a touch of food colouring, mix and spread over top of the krispies. Enjoy with a big old pretty in pink smile! I have three other recipes of Tara’s bookmarked. Her Grilled Peach Shortcake looks amazing and will be made during grilling season. I also want to make her Banana Split and Banana Split Smoothies. They are calling my name in a big way. Seriously folks, why do salads never call my name. 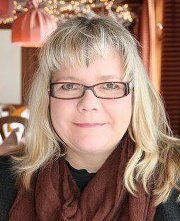 Make sure you stop by Tara’s blog, Noshing with the Nolands to follow/stalk her. She’s also on Twitter, Pinterest, and Facebook. Follow her everyone folks. Bloggers love to be followed everywhere they go. Thanks so much to Tara for being such a sweetheart. It’s been a pleasure getting to know you better. 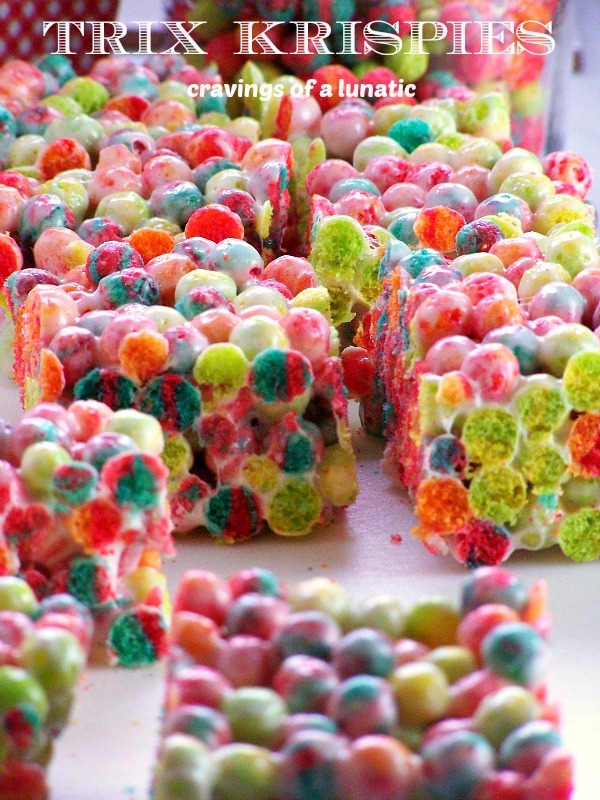 Don’t you just love Krispie Treats. I know I do. I can’t get enough of them. There’s just something about them that reminds me of my childhood. 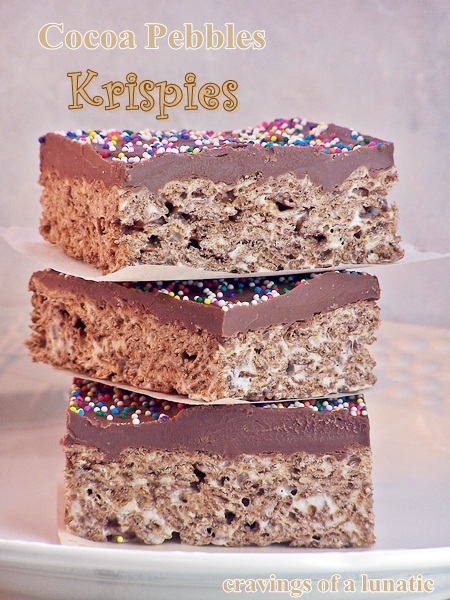 Follow Kim Beaulieu | Cravings of a Lunatic’s board Krispies Cravings on Pinterest. Now go get your krispies whipped up. I love how fast you can make these things. So many variations on recipes too. Hope you enjoy! 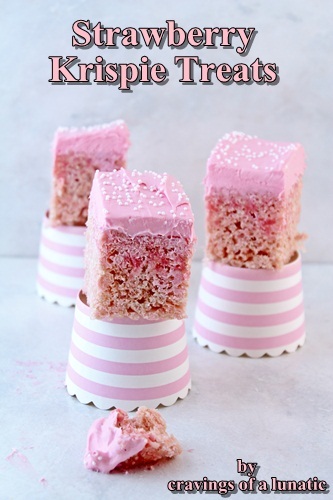 What a great interview and amazing post with delicious PINK treats! I love this Kim!!!! Nice meet your Tara! I do enjoy knowing Tara through the blogging community and her blog too. These treats are so cute! I have to make them for my niece who loves pink (and sweet too). Yayayayyyyy love Tara love you love these pretty pink krsipie treats!! Thank you so much for the most wonderful of posts. You are fantastic and so are those strawberry krispie treats!!! Great interview! I always learn so much from these. 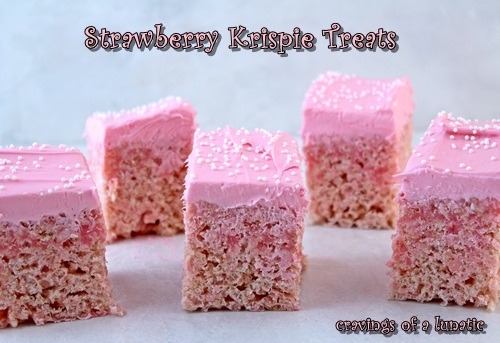 And the Strawberry Krispie Treats look wonderful! Such great color. Thanks. Now these are some fancy-pants krispy squares!! LOVE THEM! So glad to have met you via our blogging sites on Facebook and also glad we are now following each other! 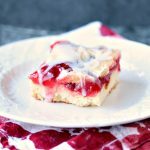 What a wonderful interview and delicious recipe! 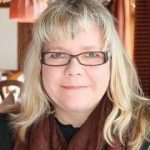 I love Tara’s blog! 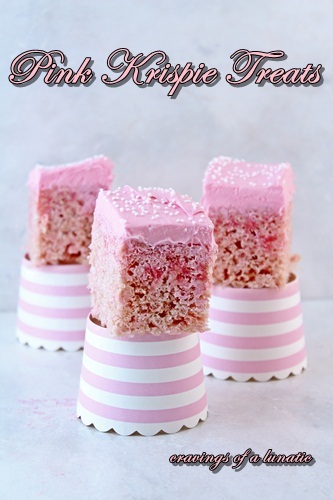 These rice krispie treats look fantastic, and you gotta love that pink frosting. Yum! Sp pink and girly – love it! 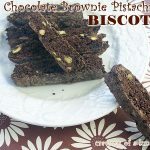 Hi Tara, these look so pretty and I am sure very addictive! Great interview with Tara! And how come the RKTs I make never look like yours? Beautiful!!! It’s all smoke and mirrors. Seriously, totally trickery. Ohhh these look fantastic! I love strawberry-flavored things, and that pink color is too pretty. Fantastic job, Tara! Not sure if you are still actively answering comment questions. If so, what size is the marshmallow bag in US measurements? Also, I’m familiar with canned frosting but what brand name for a “package of vanilla frosting”? Loved the interview….just found you on Pinterest. Glad you found me. I answer all questions unless they get by me. If they ever get by me I tell my readers to email me. I never want anyone to struggle with a recipe so I’m very available to readers for help.